Little by little, we’ve been painting and updating each room in our home. My next project in my house was my office. We’ve got the kitchen done, which I shared here. The hallway was painted and I’m still in the process of choosing a layout for the pictures I’ll be showcasing there. 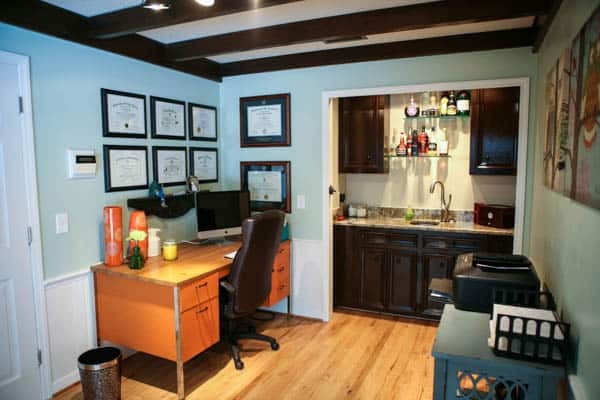 Today I wanted to share with you my latest room that was completed, my office. I wanted a cheerful, fun happy spot. I choose a color for the walls that sometimes looks green and sometimes blue, depending on the light. It’s really soothing. For my desk, which was a painted dark brown that I had done about 10 years ago, I used Annie Sloan chalk paint in orange. Somebaody gave me that ugly monster of a desk years ago, and it’s the perfect size and shape for me. I love how much storage it has. So instead of trying to replace it with something that’s not really functional, I decided to make it a little more fun with new drawer pulls and a fun new orange color. Since I didn’t feel there was quite enough room for my printer on the desk, I purchased a little side table at Kirkland’s for the opposite wall. It holds my printer, my computer’s backup and the router. On the ceiling, you can see the track lighting I installed. Previously the room had a very small light fixture. It really wasn’t enough light for the room. Adding this fixture between the ceiling beams, with four adjustable lights adds much needed light to my work space. 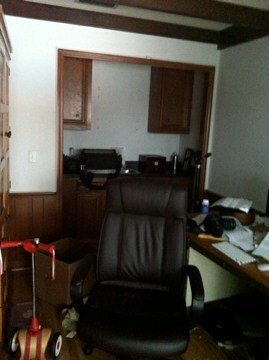 Here’s the before picture I snapped quickly right after we moved in. You can’t really see much. The trim in the room was all wood. 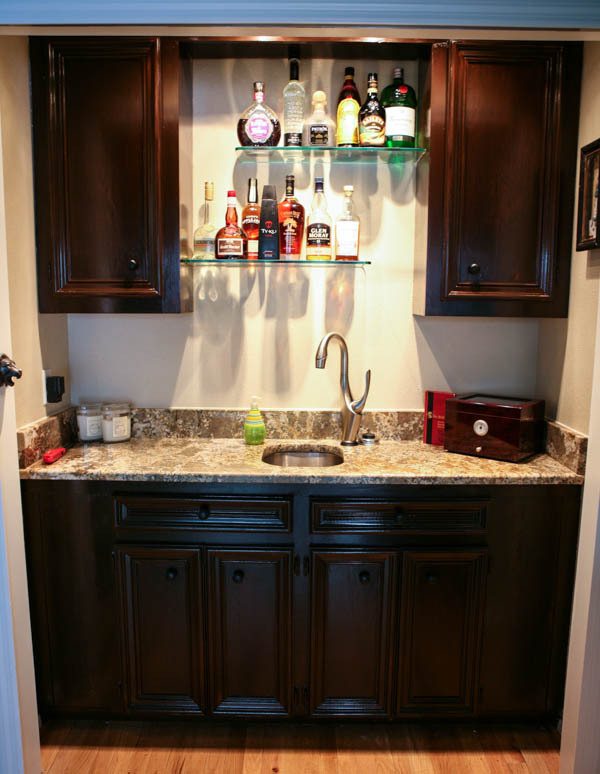 The cabinets in the wet bar were stained a lighter oak color. The counter was black laminent, and it looked like there was definitely something missing between the cabinets. There was a basket weave wallpaper on the walls that had been painted white. It was torture to remove. My old desk was cream and painted dark brown, and I had my armoire full of prop dishes in the small space, which I have since moved to the family room. Here’s a closer look at the wet bar after. I used the same walnut stain on the cabinets that was used in my kitchen. We also used the same granite. We added the glass shelves for extra storage and for display. 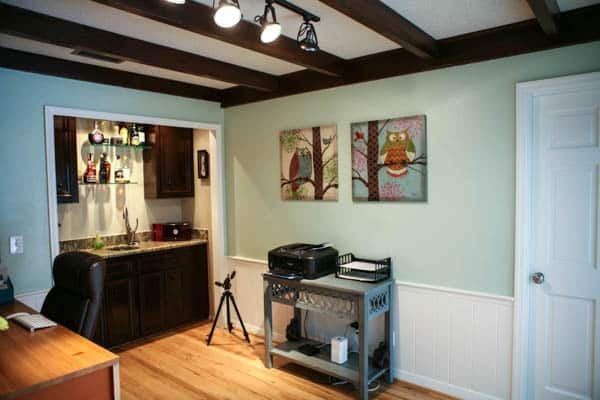 I painted the inside of this bar area the same color, but a bit darker than my kitchen. It’s called Bleeker Beige by Benjamin Moore. We also added another track light that’s hidden from view for extra light in this area. The sink is an undercount, and the faucet is a Vuelo made by Brizo in the bar/prep smaller size. It’s one of the touch faucets. And it’s so nice having it in my office. I like to take photos on another small table that I sometimes have in my office or on the floor. Having the sink nearby makes cleanup after food photos a snap. Brizo provided us with the faucet shown. All opinions 100% mine. This is gorgeous! The beams. Swoon! Great job girl! Awesome job! It looks really good. This looks wonderful! The owl prints are great and I love the paint color you chose. Your house is coming together to be a really lovely home. What a great change! Mint colours look refreshing. This is one good example of a fully maximised space. Hope to see more of your posts soon.